Excercise 1 is a re-cap of the previous lessons adding the notes B - F# and C# to a basic A minor Pentatonic scale.These are all main tones in the Major blues structure. The chromatic notes in the second half of the video are more passing notes - in other words notes that can be added to give a rhythmic push but never to hang around on. Like many areas of music there are no hard and fast rules but in my experience these chromatic tones work best going upwards. 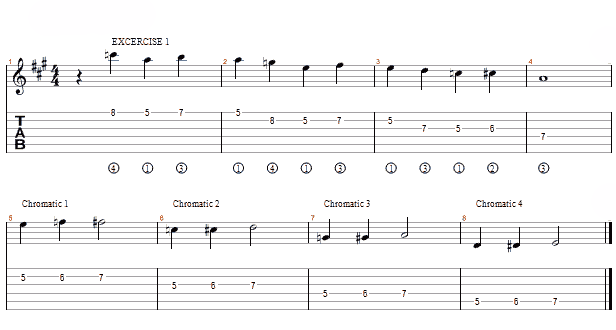 Chromatic 1 [see tab] is best used as a lead-in as the chord sequence changes to a D (from either A or E ). The same applies to Chromatic 2. Chromatic 3 is all round useful on most parts of the sequence - also an obvious lead-in to the A part of the sequence. Chromatic 4 is also pretty good all round and works well as a lead-in to the E chord.